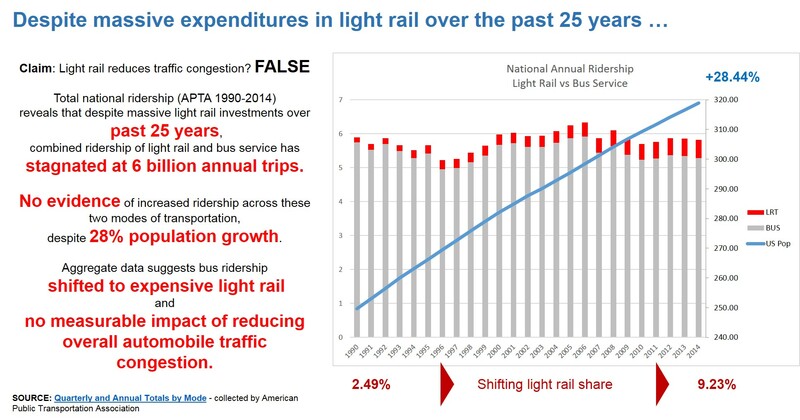 Generally, one-half or more of the light rail riders formerly rode bus services that were replaced by the rail service. The new ridership attracted to light rail from freeways is in fact quite small compared to the carrying capacity of a single freeway lane. 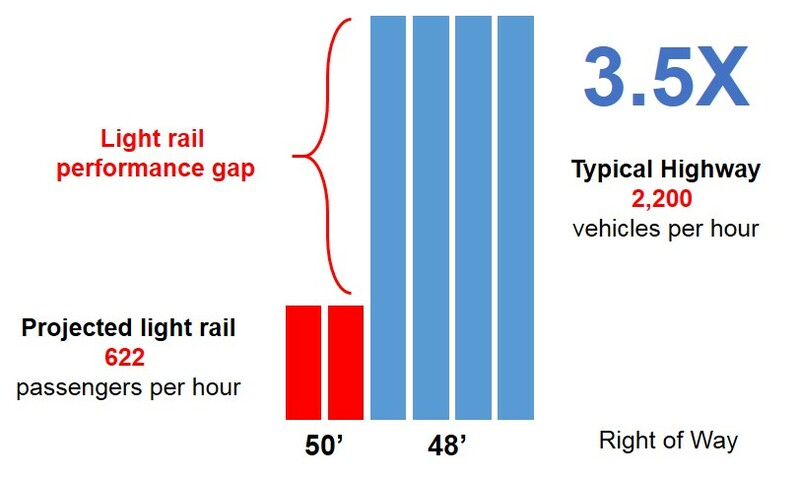 The average freeway lane in US metropolitan areas that have built new light rail systems (since 1980) carries four times as many people per mile as light rail. Even signalized surface streets average twice as many people per mile as light rail. The mean travel time to work according to the 2014 US Census is 21.5 minutes (Durham County) and 22.0 minutes (Chapel Hill), yet the proposed DOLRT will take 44 minutes (+10 minutes at terminus) . Now include the waiting time for the next train, the time to get to/from the station (via Park&Ride, Kiss&Ride, bicycle, walking, or bus transfer), it will even be LONGER. So how is this faster than the automobile that it is supposed to replace? In North Carolina, Eric Lamb, Manager of the City of Raleigh Office of Transportation, is not so sure about the correlation between transit and congestion abatement. 5 He cites South Boulevard in Charlotte which directly parallels that city’s Lynx Blue Line light rail system. Despite the light rail line … there has been no corresponding reduction in traffic volumes along South Boulevard. The latest revised DO LRT estimates project 23,000 daily boardings (in 2040) during 18.5 hours of daily operation across the 17 mile circuit (at a cost of $1.6 BILLION or $94 million per mile) to serve an average 622 passengers per hour (on each track). While advocates will argue that LRT has higher ‘capacity’, it will not necessarily mean that it has higher ‘usage.’ We should not confuse capacity with usage. So how does that compare to the much hated highway? Well, not so well. A typical highways can accommodate 2,200 vehicles per lane per hour (human driven), utilizing about 5% of roadway capacity. And you can place 4 lanes within the same 50′ right-of-way required for RLT. And as autonomous vehicles become pervasive, this capacity will increase significantly, as the vehicles will be able to drive in much closer proximity thereby dramatically increasing the capacity of our existing roadway infrastructure. By using BRT, we will be able to organically add this capacity; whereas with LRT relying on steel rails, we will not, as it will be dedicated to only for the train and we will not be able to share with other autonomous vehicles.